Everyone knows that the initial purpose of the mobile phones was to create a way of communication. Then by the introduction of SMS, there was an addition to the way to communicate with others, at comparatively a low cost, and now we have more than these two ways of communication on a single device. But now cell phones are not only use as a way to communicate but it has now given various things to perform on this small handy device, like playing games, watching and listening to movies and music, social networking, browsing the world through internet and so on. The organic nature of the phone produces ripples, when touched the screen. The GUI of this mobile uses TouchWin “Nature UX’ interface, which is deeply inspired by organic trend. In response to Apple’s Siri, SIII provides the services of Samsung’s intelligent personal assistant, S Voice. It understands eight different languages and we can operate twenty functions through this assistant. Provides some commonly used applications like YouTube, Google+, Google play, Game Hub, Video Hub and so on. From 2012 Samsung has introduced the facility to transfer music, photos, podcasts, and text messages from iPhone, by using the Easy Phone Sync app. SIII has this smart feature to share its screen onto a TV. Music Hub in this wonderful device contains over 19m songs. It was created in response to Apple’s iTunes service. Another music feature the Music square is a remarkable one that manages the songs according to the user’s mood. By using Vlingo and Google’s voice recognition, the user can use speech-to-text feature on Samsung SIII. SIII comes with round corners and the edges are curved. Color option for the handset is marble white, pebble blue, garnet red, sapphire black and titanium grey. The device is 136.3 mm long, 70.7 mm wide, having a thickness of 8.6 mm. SIII offer upto 2 GB of RAM. The device comes in 16 GB or 32 GB for internal storage purposes, the memory is extendable upto 64 GB, using a micro SD card. Using the cloud storage facility of Dropbox, the purchaser can avail a storage space of 50 GB for 2 years. The display of the cell phone is 120 mm, with HD Super AMOLED display. The pixel resolution is 720p. The display glass is damage resistant. The rear camera is 8 megapixels, can take 3,264*2448 resolution photos and can make video upto 1,920*1080 pixel resolution. Photos can be taken while making a video. The front camera is 1.9 MP. The device uses li-ion 2,100 mAh battery. The talk time for 2G, 3G and 4G is upto 21 hours, 11 hours and 10 hours respectively, while the stand by time for 2G, 3G and 4G is 900 hours, 790 hours and 500 hours respectively. SIII uses this smart technology of ’Smart Stay’, to save the battery, by turning off the device when the users is not looking at it. The device can also be re-charged wirelessly by using a special charging pad, which uses a magnetic resonance that creates magnetic field, to transfer electricity. The Samsung Galaxy SIII is a wonderful device and offers a lot more then mentioned here. It is far better than its predecessors and is also comparable with the latest devices presented by the other well known cellular companies. 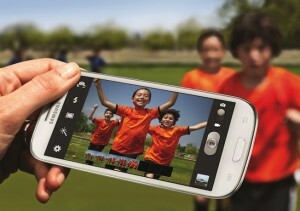 Check more details of Samsung Galaxy SIII at: http://www.samsung.com/global/galaxys3/. Galaxy S3 mobile is the best smart phone I have ever used. It has many advanced features like smart stay , Sbeam and all share a cast.